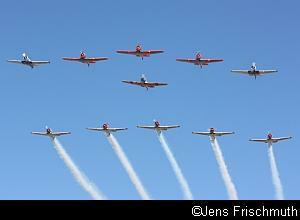 The 2010 Master Power Rand Airshow, held at the Rand Airport in Germiston, Johannesburg, took place on a mild autumn day under a clear blue sky on the 23rd of May. Flying displays took place between 10:30 and 16:00 and the large crowd enjoyed a well organized event. Aircraft movements were excellently managed with the use of two operational runways resulting in non-stop action. As usual, air show commentator Brian Emmenis and his Capital Sounds team kept the more than 20000 spectators well informed throughout the day. Proceedings started off with a parachute display. This was followed by a mass radial display flown by 11 privately owned North American AT-6 Harvards. The planes took off one by one in quick succession and then flew two circuits overhead in tight formation. Afterwards, they split up to fly the mass Tora! Tora! Tora! Bombing formation where all 11 planes flew one behind each other at an interval of a few hundred metres and dived down on to the airfield one after the other, flying a figure-of-8 and approaching the crowd alternatively from the right and then the left. Being "buzzed" by Harvard after Harvard and hearing the distinctive noise of the 11 Pratt & Whitney radial engines was an amazing experience for everyone present. ("Tora, tora" is Japanese for "tiger, tiger" and the Tora! Tora! Tora! Formation was made famous by the 1970 film of the same name that dramatized the Japanese attack on Pearl Harbour. The codename "tora, tora, tora " was used by the Japanese at Pearl Harbour to indicate that complete surprise was achieved during their attack). After the other planes had landed, the four Harvards that are part of the Flying Lions display team performed their full display routine. Other team displays were flown by the Gabriel Wings Aerobatic Team and the Goodyear Eagles, who both use Pitts Specials as their mounts. Glen Warden led the Goodyear Eagles in the absence of Dennis Spence and flew with regular Neil Trollip, and Ian Billing who filled in for Dennis on the day. 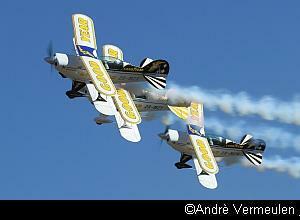 A South African airshow first was a Super Decathlon formation display flown by Pierre Gouws and Larry Beamish. Two Bell 407 helicopters performed a tandem display. A rather unique display was flown by Pierre Gouws and Rob Beaumont, who flew two very dissimilar aircraft, a North American AT-6 Harvard and a Sukhoi Su-29, in formation. The Snake Microlight Display Flying Team, DeHavilland Chipmunk Display Team and Albatross Display Team also flew at the Rand Air Show. 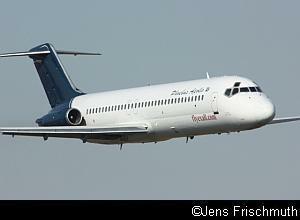 A special treat for the crowd was the display of a Phoebus Apollo McDonnell Douglas DC-9. This was followed later during the day by another first, the display of the AirQuarius Aviation Fokker F-28. 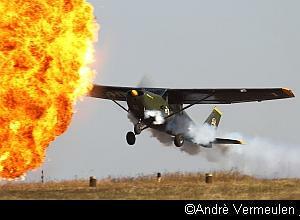 Further jet action was provided by the Aero L-39 jet flown by Pierre Gouws. Unfortunately, the advertised display of the SAAF Museum's Mirage IIICZ had to be cancelled because a problem with the parachute could not be rectified in time. Various individual performers thrilled the crowd. Phoebus Apollo displayed a DC-3 Dakota and Scully Levin performed his truck-top landing in his Piper Cub. 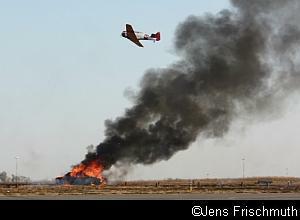 CC Pocock flew an impressive display in his "Bush Air" Cessna T-41 and the performance ended with CC flying his plane "into" a huge fireball. A solo display by a Robinson R22 showed the impressive maneuverability of this agile helicopter. Sport aerobatics is hugely popular in South Africa and the country has many world-class performers who regularly compete in international competitions as well. On the day, we were thrilled by outstanding performances from Warren Haslam in his Sukhoi Su-29, Johnie Smith in the Suzuki sponsored Slick 360, Elton Bondi in the Extra 200, Ellis Levin in the Zlin Z-50L, Charles Urban in his Yak 55, Stew Lithgow in the Van's RV-7 and Brad Bennetts in the Mazda Zoom-Zoom Extra 300. Brad's performances included a race against a Mazda MX-5 sports car and he performed an inverted ribbon cut as well. 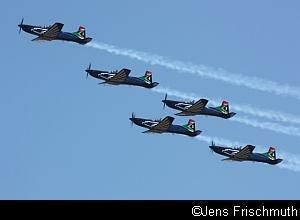 The Silver Falcons, the official display team of the South African Air Force, had a busy weekend. Besides flying two excellent displays at the Rand Air Show in their Pilatus PC-7 Astras, they performed a fly-past over the newly renovated Soccer City stadium, which was officially opened by President Jacob Zuma on the day before the airshow and hosted its first match that day. Soccer City will host the opening ceremony and the first 2010 FIFA World Cup match featuring South Africa's Bafana Bafana and Mexico on the 11th of June, as well as the closing ceremony and final match on the 11th of July 2010. At 5pm on the day before the airshow, the Silver Falcons also performed a fly-past over the Orlando Stadium in Soweto before the historic Super 14 semi-final Rugby match, the first major rugby match to take place in a South African township. They arrived back at Rand Airport in formation with the Aero L-39 jet ZU-TEE, which was flown by Pierre Gouws and used by world renowned photographer Frans Dely as his cameraship to document the historic events. Proceedings finished with another highlight of the day. The 11 Harvards took to the air again and flew the Tora! Tora! Tora! Formation again and this time, their "bombing runs" were made very authentic by the pyrotechnics provided by CC Pocock. The spectacular explosions included his famous Wall of Fire. After landing, all the Harvards lined up in front of the crowd line and media pen and performed a mass shut-down. Some Harvards stopped right at the edge of the media area and the remaining photographers had to seek refuge closer to other parked planes. Whilst revving their engines in unison, they used their smoke systems to add to the spectacle. Then all the engines fell silent at the same time. Someone soon decided that it was not a good idea to have the Harvards standing around on the taxiways, so the pilots were asked to get back into their planes and return them to their original positions. When the Harvards started taxying through the by then deserted media area, the photographers thought they might have overstayed their welcome! 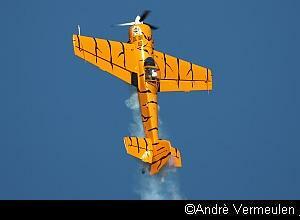 This close-up, spectacular entertainment typified a hugely successful and entertaining airshow. All credit goes to the organisers at Rand Airport, Air Show South Africa and the sponsors (Master Power Technologies, Coca Cola, Air BP and AirQuarius Aviation) for staging an outstanding event.